NO WALK IN CEREMONIES PERMITTED-Ceremonies must be scheduled in advance. Please note that ceremonies are only allowed in Leatherneck Gallery and outside of the Museum. Ceremonies are NOT allowed in the historical galleries. Ceremonies in Leatherneck Gallery begin at 0930 and must conclude by 1630. Promotions are scheduled for 30 minutes. Retirements are afforded 60 minutes. You may arrange colors. (We can provide the National Ensign and the Marine Corps flag and their respective bases.) We neither post GO/Flag Officer standards within the museum nor do we have a Navy flag available for use. You may bring soft, appropriate music. (Sound system and extension cords are your responsibility.) Live music is conditionally allowed; please ensure to include this in your request. Due to a limited set up space, chairs are conditionally permitted and prior approval is required. Please note that a ceremony with over 100 chairs requires the Director’s approval. Please provide working party for set up and break down of chairs, podium, and colors. 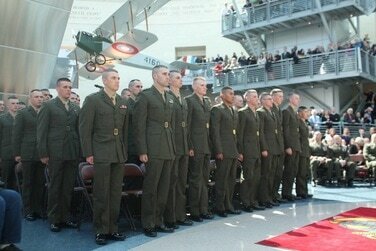 Receptions at the Museum are managed by the Marine Corps Heritage Foundation. For more information please contact the Special Events team at 703-649-2350 or events@marineheritage.org. Submit your reservation request electronically (see form on this page) or download the﻿﻿ Military Ceremony Reservation Form﻿ and email it to﻿ Visitor Services Specialist Joshua Stephens at joshua.stephens@usmcu.edu.